Discover the range of lawn care and decorating services we can accomplish to personalize your home. There are many different services that Barbarossa Lawn Care & Landscaping provides for each of our clients, and can assist you with whatever you may need. As in every lawn care company, we offer lawn mowing services, that make your lawn green and healthy, as well as seasonal cleanups to keep your property looking its best. We can plant trees, trim and prune bushes, and even shape them to your taste. 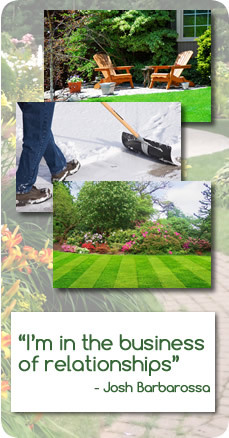 Barbarossa Lawn Care is much more than just a lawn care company who helps you maintain the look you want. We are a company that can help you create a lawn that gives you greener grass, and provides you with the ideal solutions for all of your lawn care and landscape desires. Most lawn care companies are willing to do a majority of the jobs that we do on a regular basis from teaching you how to make your lawn green, mowing the lawn properly, and the shaping and sculpting of the property so it can reflect the details that you care the most about. While we have listed a fair few of the services that we can provide to each of our clients, we will also do almost anything else to help our customers achieves the desired state of each of their lawns. Barbarossa Lawncare works with you to achieve the highest results for your property in terms of quality and design, and can help you create the ideal scene that you have imagined for your property. When you have decided that you need to clean or reshape your lawn, give us a call and we will be glad to assist you with whatever you may need.